A landmark week for ICOs. Cooley and Protocol Labs released the SAFT Project, a collaborative effort to further develop a standardized framework for (US) compliant utility token issuances. In others' view, a small circle's attempt to protect their own turf that is antithetical to the general ideology behind the crypto space. More on that later. The SAFT instrument, while not being perfect, is a framework transaction structure for utility tokens that “satisfies the spirit of the law”. The novelty here is the taxonomy of utility tokens into pre and post functional, something Santori has clearly been thinking about for a while. The crux of Cooley's interpretation revolves around the second part of the Howey test, namely the two prongs about “expectation of profits” and “solely from the effort of others”. the effort of the development team is clearly the main driver of those expected profits as the team will be uniquely responsible for delivering network functionality. On the contrary, Cooley believes there are strong arguments for those prongs not being satisfied in the context of the sale of a already functional tokens, where the expectation of profit can be diluted by expectations of actual utility, and in any case any expectation of profit cannot be directly attributed to the effort of the development team. At that point in time, once the network is fully functional and the tokens are freely tradable, the market dynamics of supply and demand ought to prevail over the “effort of others” prong in the expectation of profits (just like in commodities like gold or silver). “Even if we completely ignore the fact that many of these schemes have Zug-based non-profits supervising their development, cryptocurrencies must be staked or mined; that is effort, with commonality between miners and holders, and that continued effort is essential for the continued existence of the enterprise”. The SAFT is architected in a way that navigates the relevant law, while being more tax friendly for the seller. For one it is an investment contract and thus a fully fledged security, and as such it can be sold to accredited investors only (unless one wants to go through the lengthy and costly process of SEC registration, or gets an exemption). Investors purchase the right to receive tokens in the subsequent network launch, at that point the tokens can no longer considered securities as the expectation of profit is unlikely to predominantly come from the “efforts of others”. The implications of this paper could be significant. Will there be an alternative schools of thought championed by a different group? What's the SEC’s next move now? How would the federal court deal with those projects that have already sold pre-functional tokens? How will other jurisdictions position? At this stage we have more questions than answers. Based on the pulse we are getting from various crypto communities we are part of, the cynics blame the SAFT Project for potentially re-engineering a system that favours the wealthy investors, in antithesis to the democratising spirit that started this industry. “The SAFT is a re-centralization vector which serves the interests of a very limited/specific few and is antithetical to the general ideology behind this space. There is a serious risk of it getting traction and becoming seen as a standard of sorts and then we wind up stuck trying to work around 80-100 year old laws rather than seeing the laws themselves re-evaluated and adapted to the new world we live in.” Says Joe Urgo of District0x. Indeed the whole industry exists because some of its early contributors decided it was worthwhile taking legal risk for the sake of starting a revolution. "When users own a network, they care for and shape it. To believe fully in a decentralized future means to believe in early user ownership." says Tom Kineshanko from Protos. While that has given birth to a breakthrough computing paradigm capable of potentially re-writing the fabrics of the entire economy, it has also created a very fertile ground for scammers to take advantage of the regulatory uncertainty (see the next post!). And that’s clearly not good for the industry either. "Regulation is the only chance for the market to make a soft landing. Otherwise the market will auto-regulate the natural way, with a violent crash." says Pierre Entremont of Otium Capital. A common ground needs to be found, collaboratively. The hope is that, thanks to initiatives like the SAFT Project and complementary or alternative views voiced by other players in this industry, the Regulator will engage with an open mind to enact the necessary regulatory reforms ultimately aimed at enabling the potential behind this new technology. If not, the decentralised revolution will carry on elsewhere anyways. BONUS: the exact same day Cooley's released the SAFT Project, Swiss blockchain law firm MME introduced a new conceptual framework for legal and risk assessment of Blockchain Crypto Property (BCP). In all honesty, we have had no time to also dig into their paper. We'll try to dissect it next week (though if anyone has reviewed it and wants to guest post let us know). “What truly matters,” reads one ICO marketing website, “is that which is non-material, invisible, and unobservable”. Just buy a token for it. “I would like to invite you to register,” reads a LinkedIn message, “membership gives you the Presales discount option, which is a 25% discount … Price is increasing every day, so the earlier you join the better.” And please use this referral name which triggers a payment in a multi-level marketing scheme. And here’s my favorite: “Bitcoin for Pets: We will accomplish this by connecting an end to end IoT ecosystem powered by our Artificial Intelligence platform”. Right. For all the economic activity a cat manufactures with naps. It isn’t supposed to be like this. The crypto-economy promises new openness, transparency, participation and fairness. But instead, we now have a white hot market of sharks flipping ICOs, manipulating unsophisticated investors, and skirting consumer protection. Not all, but too many. ICOs have done an incredible feat. They have collapsed all asset classes – cash, equities, fixed income, derivatives, commodities – into one software wrapper. And they have put into the same structure non-securities, like insurance contracts, human attention, and fog computing units. But they also collapsed all investor types into the same pool. Long-term institutional holders of public stocks, short term speculators and day traders, early stage venture capital investors, sophisticated Crypto developers, and the average Kickstarter backer are now all riding the same wave of crypto volatility. And what’s particularly damaging, in my personal view, is that the short-term speculators are forming the discourse about the future of technology. Look at the internet forums. Look at the Slack and Telegram channels. Listen in to the private conversations about pre-sale discounts. Instead of going long and illiquid – where entrepreneurs have to drag their idea to product-market fit before taking a market salary – early stage investors are popping ICOs to make 30% returns (and far more) in a week instead of building our utopian tech infrastructure. By the end of the 16th century, after the Spanish flooded the European continent with gold from the colonies, the Spanish monarchy experienced three major bankruptcies. Too much bullion with no underlying economic activity. Overfunded whitepaper companies now see the relative inflation of assets like human capital versus the crypto they issued in their ICO. Developer-led companies looking to launch tokens are facing competition from a marketing glut of opportunistic projects, distributed by firms that charge several Bitcoins for aggressive distribution campaigns and running the ICO process. Instead of marketing, those Bitcoins should be going into development. Regulation is stepping in across the world, from China, South Korea and Russia to the United States, United Kingdom and Europe -- and for good reason. A forest fire will be good for new growth. If you don’t believe in human capacity to deal with the issues, perhaps regulatory automation is your solution. But beware even the thoughtful designs from Vitalik and other brilliant developers regarding fair ICO distribution mechanisms. Much of the ecosystem’s thinking is rooted in classical economics, which is flawed in its assumptions of rational actors and failure to acknowledge deep behavioral flaws in the human animal. Putting such utilitarian thinking into software and scaling it to millions of people creates the danger of building infrastructure with normative implications we want to avoid. Just because we can build the most efficient honeypot that “incentivizes” (i.e., persuades, manipulates) investors using FOMO, loss aversion, and other behavioural biases, does not mean we should. Just because we can have software that functions like a multi-level marketing scheme, where insiders cash out and regular investors hodl the bag, does not mean we should. I hope that we as a community don’t go down this darker road, and in doing so build a future worth believing in. Aragon have re-architected their smart contract system into an 'operating system' called AragonOS. The idea is that an organization is composed of various modules (i.e. applications), co-ordinated by a core upgradable Kernel. Aragon released the code of the first six default applications, as well as the Kernel. All open sourced, all documented for everyone to see. But the goal is to ultimately let third party developers build the apps and that's when the grand vision for Aragon's decentralised governance platform will start materializing. Oh, they are also hiring! Teemu from Zeppelin dares to question Joel Monegro's seminal Fat Protocol theory. decreasing marginal benefits of scale as interchain interoperability takes off, making protocols easily interchangeable in the stack. We featured our friend from Otium Capital Pierre's latest post as it resonates strongly with what we are seeing in the market. 📈 September '17 numbers are out! 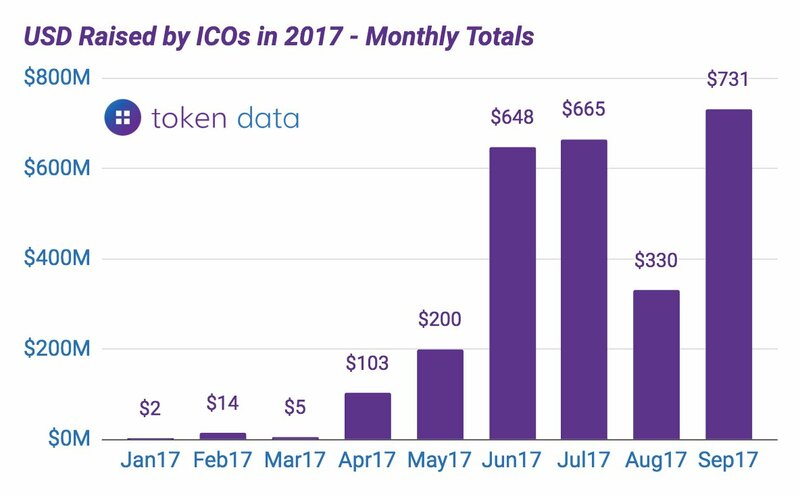 No signs of slow down in ICOs despite the heated regulatory debate, though we published last week some numbers showing less projects are reaching their set targets. Bloomberg exposes the wide spread (but seemingly denied by all questioned) practice of flipping ICOs amongst hedge funds. If an investor has taken real tech/product and team risk early on, and that's rewarded in the market at network launch, 9-12-18 months later, taking some money off the table under a sensible vesting schedule feels somewhat justifiable. I wasted 45 seconds trying to interpret the website and decipher the "whitepaper": the project seems to be about a stable coin, another coin that earns a dividend from staking the stable coin, an ATM network AND of course an exchange. I could not make any sense of it all. Parity has launched PICOPS, short for Parity ICO Passport Service. It's effectively a service that lets a user link her Ethereum address to unique and verified ID for a fee of 0.024 ETH. The point of it is to let users pre-KYC their address (via an integration with Onfido) so that applications that adopt it can automatically transact (or not) with such addresses without having to run the identity checks themselves. Another decentralised exchange powered by the 0x protocol, this time by a team close to Augur (Joey Krug and Jack Paterson are both listed as advisors and the lead engineer worked on it). Paradex is working on developing a peer to peer order matching engine for ERC20 tokens, behind a well-designed user friendly interface. They target mainnet launch for November. Finally a site that lists tokens by inflation-adjusted network value rather than based on circulating supply. They only list 42 so far, but they will be adding more daily. Also like the attempt to cluster tokens by sector. While Jamie Dimon dismissed it, rivals at Goldmans are apparently debating whether to start a Bitcoin trading desk. What a moment for crypto when that will be confirmed! CEO Lloyd Blankfein himself took the time to clarify on Twitter that they are "still thinking about it, no conclusion - not endorsing/rejecting. Know that folks also were skeptical when paper money displaced gold." We missed this last week, but it's so significant that we thought to include it despite being a little dated. The Managing Director of the International Monetary Fund admits that cryptocurrencies can replace national monies, conventional financial intermediation, and even "puts a question mark on the fractional banking model we know today." Bitwise Asset Management, ran by two 26 year old ex Google and Facebook, have launched their first product in their line. Called HOLD 10 (rather than a more obvious Hodl 10), it is an index fund that will hold and weight the top 10 cryptocurrencies by inflation-adjusted market capitalization, accounting for the supply inflation schedules for the next five years and granted enough volumes are traded. The news made noise as Naval Ravikant himself is the main investor in the fund. Given the current hype around the space, the hassle of custody for these assets, the prohibitive fees and minimum cheques required by crypto hedge funds and the present lack of ETFs with crypto exposure, it feels like this product could be very popular amongst accredited investors. Charging 2-3% annual management fee and no performance fee, this is a pure scale game. Bonus: a tokenized index fund of the top 20 crypto currencies is launching its ICO next week. Digital asset management platform Iconomi have announced the first batch of 12 DAA Managers. Will Mougayar is one of them with his own shiny William Mougayar High Growth Cryptoassets Index of 15 crypto assets. He takes 5% total fee per annum (a 2-3% premium to passive index funds), with no minimum. Iconomi does the custody. The portfolio construction and weights are not quite what one would expect from a balanced index fund, arguably dictated by what Iconomi makes available at the moment. Mr fund management Ari Paul made the point succinctly.